One pan – all you get dirty is a fork to mix it up! And eggless too! 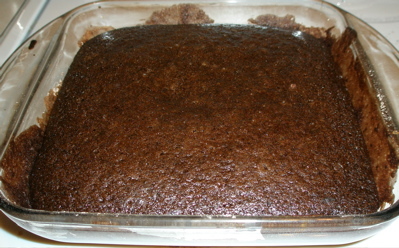 Think of it like a dense, moist brownie. Preheat oven to 350* degrees. 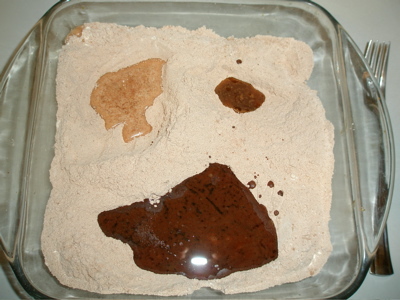 Thoroughly mix dry ingredients in an ungreased 8×8″ heatproof glass pan. Make 3 wells in the dry mixture and pour the oil in one, the vanilla in a different one and the vinegar in the last one. Pour the cold water over all and stir with fork until well blended. Bake for 30 minutes. 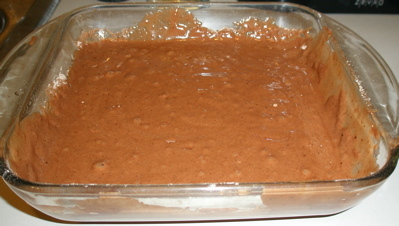 Cake is done when center springs back when lightly touched. Do not test with a toothpick or knife.